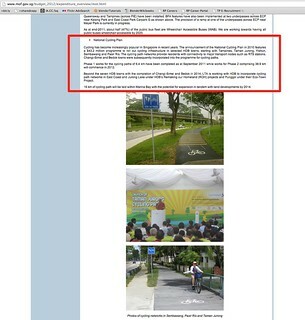 Over the weekend, a few of my friends were discussing about Singapore's National Cycling Plan via email. One of our friends offered to collate our ideas and suggestions to relay to the right government agency folks. I love our Park Connectors. I ride on the Khatib Bongsu park connector most often (sometimes connecting all the way to Woodlands Waterfront, through the Admiralty connector). I've noticed minor improvements to the Khatib Bongsu connector in the last two years. There's still room for a better/ safer experience for cyclists and pedestrians. There was a suggestion that I should blog about my suggestions. It's fresh off my mind anyway, since my wife and I just completed an early evening 16km ride today, to the end of Simpang Kiri. Ideally I should include actual images of the parts I've described. But I didn't really plan to give a comprehensive list until after the ride. Hope the map screenshots, with the descriptions, would help. Well, I'd love to show the URA or NParks people first hand. Like a Ride & Review session. Wouldn't mind taking my vacation time on a weekday to meet them (wouldn't want them to work on a weekend). Ride along the path, point out actual situations. Also I'd like to be educated on why things were designed in certain ways or perhaps the constraints they faced. 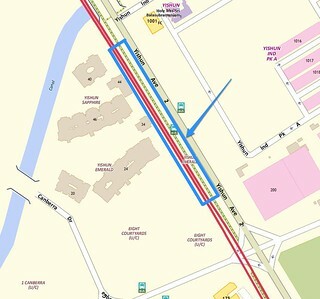 1) From the junction at Yishun Ave 1 & Yishun Ave 2, there's a stretch of asphalt that seemed worn out. The painted speed stripes seemed particularly high. It appeared as if the asphalt on parts unpainted were badly eroded (I've seen newer paved bike paths and they are definitely smoother). Going over the stripes slowly, as designed, was extremely jarring. I suspect most cyclists will choose to ride on the smoother pedestrian path. Which defeated the purpose of having the cycling path. 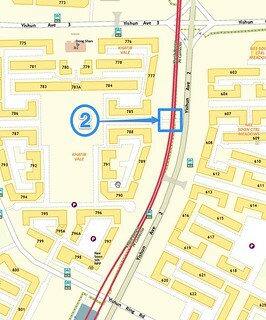 2) Along Yishun Ave 2, there's a side road for traffic to enter the carpark of Blocks 788/ 785. It splits the cycling path, though that's not the issue. The problem is that the sloped gradient (for a smooth transition from the path to the road, and then back on the path again) was only made for the pedestrian path. The sloped edge is for wheelchairs to easily transfer from pedestrain path to road, to make the crossing. The cyclist has to make a 90-degree turn to get to that sloped edge. Once I cross the road with my bike it's another 90-degree turn to get back to the cycling path and its a narrow turn. I consider myself quite OK on a bike but I don't feel confident making such a tight turn all the time. Cyclists don't want to get off and push the bike (be realistic!) so I noticed most cyclists go on the pedestrian path, which is more direct. 3) There's also more examples of 90-degree tight turns along Block 602. Then at the end of it (see the part marked 3.2) it's a dead-end for the bike path. 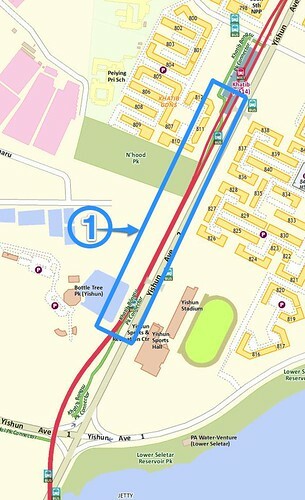 You actually have to go on the pedestrian path to make the crossing to the PCN on Mandai. I find that part poorly-designed and inconvenient. I end up cycling on the pedestrian path leading to the traffic lights. 4.1) At the stretch after the canal bridge (from Block 323) to the SAFRA Clubhouse: When the path was first constructed, I remember the asphalt part was designated as the bike path. But one day, the asphalt path became re-designated as a footpath while the concrete path (with iron grills for rain runoff) became a bike path. Pedestrians and cyclists get confused. Plus, the iron grills are not ideal when riding conditions are wet. 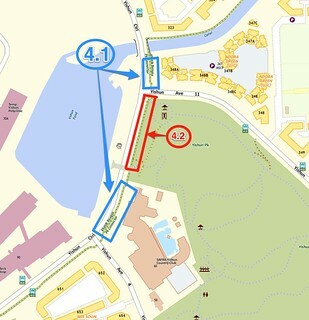 4.2) According to the map, it looks like a continuous PCN. But in reality, that stretch is a pedestrian footpath. Not a problem sharing the path, though it is rather narrow. 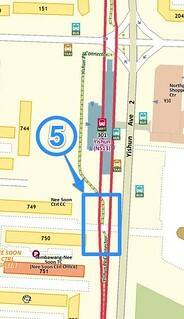 5) At Yishun MRT station, the hedges have gown quite tall (near the NTUC part). Pedestrian paths intersect the bike path and the hedges tend to prevent both pedestrians and cyclists from being able to spot each other far away. I try to ring my bell but not all the time. BTW, the same limited visibility issue affects some points along the Khatib-Yishun-Sembawang MRT tracks, where the cycling paths intersect with bus-stops/ overhead bridges pathways. Instead of plantings, the concrete columns are the ones preventing a clear view of oncoming pedestrians/ cyclists. 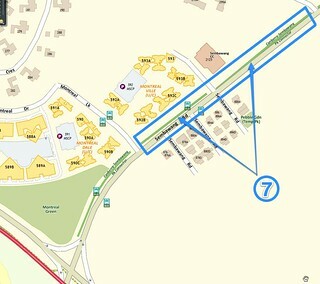 6) Outside Yishun Emerald Green condo, ideally the bike path and pedestrian paths should be switched. I've seen condo residents coming out the gates and naturally walking on the asphalt path, with is more immediate than the concrete footpath. My point is the bike path should be made further away from the gates, not the nearest. 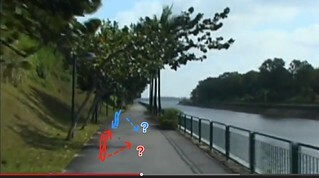 7) The stretch along the Canberra Sembawang PCN: the asphalt seems badly eroded. Ride is very bumpy. Cyclists often avoid it and go on the pedestrian path instead. 8) On some park connectors (like Simpang Kiri), the bicycle symbol has been painted on the left and footsteps painted on the right. I've noticed cyclists, runners and pedestrians naturally ride/ run/ walk on the left side when heading towards the same direction. And it's usually the left side. If I were to cycle back the opposite direction AND adhered to the designated cycling side, it means I'd be cycling on the right side now, going in the forward direction (or the left side to the opposite cyclist/ runner/ pedestrian). If another cyclist were to head towards me, we're headed towards each other on the same side. It's currently not clear who has right of way -- should I go left or the other move to their left? A game of 'who brakes/ moves first'. In the end, I find that most cyclists/ runners/ pedestrians ignore the marked designated paths and naturally adopt a "keep left" position. In my view, just sticking to a "keep left" principle for everyone would be clearer. Paint a "Kept Left" on the asphalt. 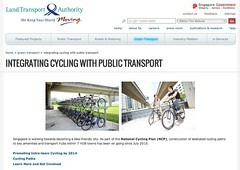 Would be great if there was a dedicated Singapore Government website on the National Cycling Plan. 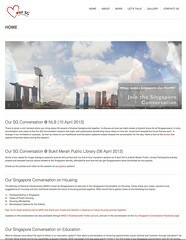 For now, one can refer to the 2012 Budget website (near the end of the page). 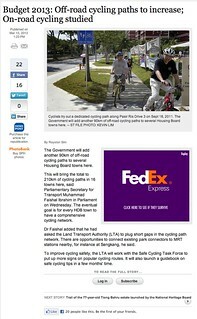 Or see this post of Mr Lui Tuck Yew's (Minister for Transport) parliament speech on 7 Mar 2012, where he mentioned the National Cycling Plan and Cycling Paths. I'm glad to see that cycling was once again part of the Budget in 2013. I've written about how I appreciate our Park Connector Network. If there was one on the National Cycling Plan, I'd love to be part of it. ASIDE: I can now better appreciate the usefulness of having a National Conversation framework. Previously I've not been that enthusiastic about any of the National Conversation topics. But thinking about the National Cycling Plan, I'd like to listen to the official views, their thinking behind the plans, and also be able to constructively provide feedback and ideas. (Thanks to Siva for the idea to blog my suggestions, and for reposting at the Cycling In Singapore) blog. You can feedback this to the Nparks via their website, addressed to The Park Connector Team. I made a complaint about Khatib Bhonsu PCN many months ago about the potholes, but nothing is done as of today. I have also informed them that the bike stands at the end of Simpang Kiri PCN have been damaged, but again nothing is done. Hi INVS 2.0, thanks for the comments. I'll be sure to send my feedback to NParks directly, though this time it's through a contact who knows the staff in charge. Do you use the Simpang Kiri often? I cycled yesterday evening and didn't encounter any serious potholes. I'll have to check the bike stands next time. Cheers!